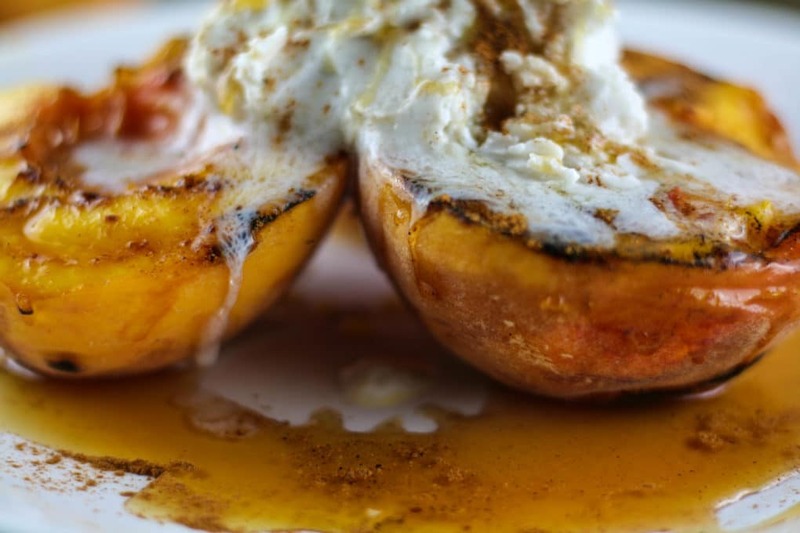 Grilled peaches and summertime, they just seem to go hand in hand like peanut butter and jelly! We’re lucky enough to have local peach farms nearby where we can easily get our hands on fresh, summer peaches from local, homegrown farms. And because we are wanderlusts at heart, we love a good road trip. We headed out on a Sunday afternoon on a short road trip to a local peach farm and picked up a 1/2 peck of peaches. (That kind of sounded like a tongue twister, huh?) As we headed home I started planning out all of the summer treats I could make with these fresh farm peaches. In the summer I am all about the grill. I would much rather grill than heat up my house using the oven, so when the opportunity presents itself for another grilling option I jump all over it. 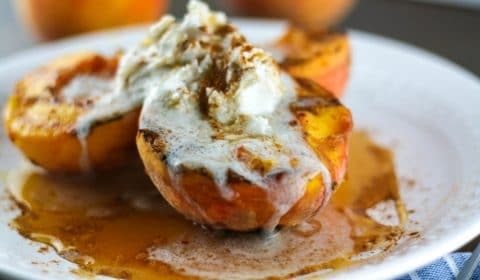 The grilling process heats up the peach but leaves it soft and juicy, and you only have to grill the peaches for just a few short minutes so they’re quick and easy! The most time consuming process would be the coconut cream, which is all of about 5 minutes. 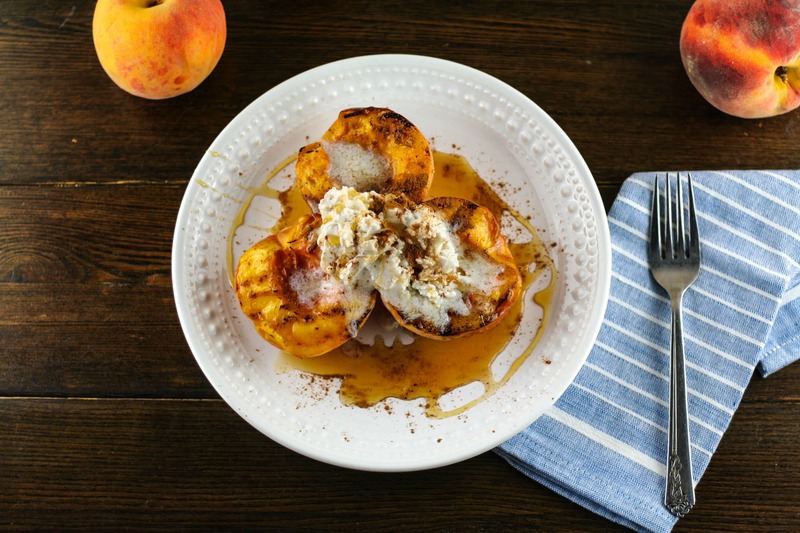 After grilling the peaches, I topped them off with my Paleo-approved coconut cream, raw honey drizzle and cinnamon. If you prefer ice cream, use that instead! Cut fresh peaches in half and remove seed. I leave the skin on when grilling peaches. Heat grill on medium heat and grill peaches 2-3 minutes on each side. Keep flipping the peaches every 2-3 minutes until they soften up and you have nice grill marks on the peaches. 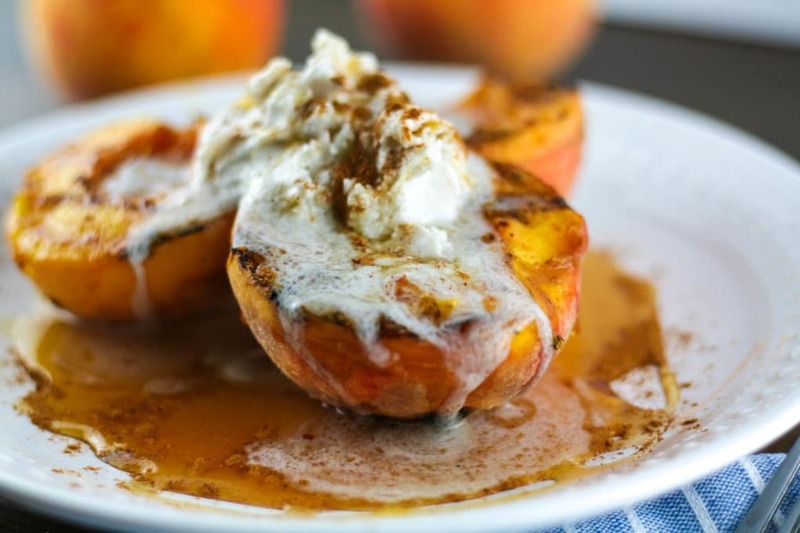 Drizzle honey over peaches, top with coconut cream and cinnamon.